Manila, Philippines – Talking about ending the First Round of NCAA Season 89 Men’s Basketball on a high note, the EAC Generals were victorious against the gritty Lyceum Pirates via 83-76. The game was close right from the get go up to the last minute of the 4th Quarter as both teams were giving it their all just to get that momentum booster win that may change their fate in the 2nd Round. The game went down the wire. John Monteclaro of the EAC was the one who put the finishing touches to the game when he hit that big 3 pointer that pushed his team’s lead to 7 points with a little over 17 seconds left in the ball game. That shot literally gave EAC their 2nd win in this year’s NCAA as it staved off the Pirates’ rally. This win of the Generals proved to be costly as 2 of their main players namely Jack Arquero and John Tayongtong both suffered ankle injuries. “Parehong ankle injury yung kay Tayongtong tsaka kay Arquero. After nun sabi ko lang sa players stay focused lang sila. Pinanlabanan lang nila. And we beat them sa rebounds. Good thing we won,” said EAC’s headcoach Gerry Esplana. He also praised their import Noube Happi as he leads his team to the 2nd Round. “Happi is the best player for me. Malaking bagay tong panalo na 'to coming to the 1 week break. 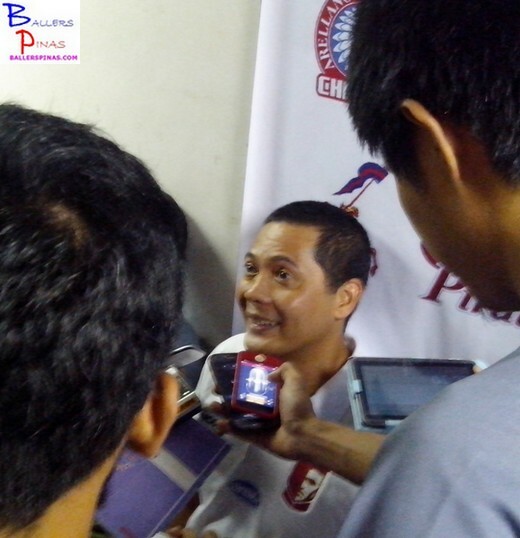 Medyo makakadiskarte kami sa 2nd round,” added Coach Gerry. Happi led his team with a double-double 25 points, 20 rebounds and 1 block. The energizer bunny and high flyer Tirso Lesmoras on the other hand, led the Lyceum Pirates with 28 points, 7 rebounds and 2 assists.